Artisan Plastic Surgery is full-service and customer-centered. At either of our two locations, you’ll enjoy a full range of both surgical and non-surgical aesthetic services, as well as expert skin care. Our retail area offers lovely the finest European lingerie lines to complement your new figure. Each item we carry was specially chosen by the doctors. We’ll even help you get the perfect fit. 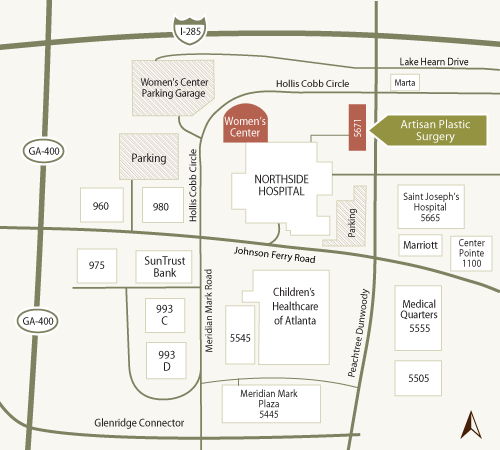 We have two Atlanta locations for your convenience: Perimeter & Johns Creek. To make a plastic surgery consultation appointment with Dr. Alexander, Dr. Chang, or Dr. Wang Ashraf at our Perimeter location please call (404) 851-1998 or contact us online. To make a plastic surgery consultation appointment with Dr. Wang Ashraf at our Johns Creek location please call (770) 622-2498. or contact us online. This beaded African piece is from the Monkeybiz project, which empowers African women by employing them to revive this ancient form of African artwork. The rug was handmade by an Iranian breast cancer survivor.